TIAS regularly hosts or co-sponsors training in topics in the context of Integrated Assessment. Forthcoming and past summer/autumn/winter schools are listed on this page. For a listing of external (non-TIAS) programmes, see our external training and education page. Postponed to 2017: 2nd Academy on Disaster Risk Reduction and Climate Change Adaptation: Applying Science and Strategies at the Community Level. In Mexico. Co-hosted by El Programa de Investigación en Cambio Climático (PINCC) and TIAS. 28 Oct. – 6 Nov. 2015: Concepts, frameworks and methods for the comparative analysis of water governance. The Autumn School was co-hosted by Institute of Environmental Systems Research and TIAS and sponsored by the Volkswagen Foundation. 01 Dec. – 13 Dec. 2013, Winter Academy on Disaster Risk Reduction and Climate Change Adaptation: Applying Science and Strategies at the Community Level, Guanajuato, Mexico. Co-hosted by PINCC and TIAS. 25 June – 6 July, 2012 Summer School co-sponsored by TIAS: Adaptive Thinking for Navigating the Anthropocene, Budapest, Hungary. TIAS was a co-sponsor of the 2009 Summer School. Understanding global environmental change: Processes, compartments and interactions. Netherlands. 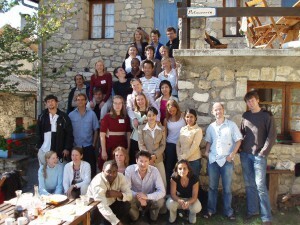 NeWater – GWSP Summer School 2008: “Managing Change: Tools and Methods for Adaptive River Basin Management”.